Added on October 28, 2014 by Evan Gruzis. Added on August 11, 2014 by Evan Gruzis. Added on July 10, 2014 by Evan Gruzis. The Hole is proud to present our summer exhibition in the main galleries, Go With The Flow, looking at the diverse and contemporary uses of sprayed paint. From aerosol to airbrush and further into the field of atomized paint, these artworks range from the slickly gradiented to the more surreptitiously sprayed, with a lot of flying paint in between. Atomizing paint is an approach often associated with the automotive world, industrial painting and products, even down to the boardwalk airbrush tee. The history of contemporary artists using spray is more limited; Surrealists explored the nascent technology, Kandinsky, too; and really not too much else went on in sprayed painting besides a 60s L.A. airbrush movement or Jules Olitski until the slick fabrication art of the 90s upsurge in industrial painting techniques. After digital technology made the world of images screenic and pixelated, gradients reappeared in painting as a mainly digital aesthetic with compressors the easiest way to achieve them in painting. Simultaneous to all this, of course, the 70s and 80s birthed graffiti culture, the single most impactful global image movement, and the world's cities have been covered in spray ever since. Besides the often-embarrassing graffiti art in galleries, this aesthetic mostly influenced painting from afar, with artists like Sterling Ruby borrowing the tools and vibe, or Barry McGee conceptually tackling the culture head-on with his animatronic tagger sculptures and huge fill-ins on museum facades. Artists like Greg Bogin, Michael Staniak, Evan Gruzis, Eric Cahan or more emerging painters Timothy Steele or Zane Lewis favour the perfect color gradients possible only with spray. Getting the seamless tonal shift of a sunset across an artwork is the magic realm of sprayed paint where the eye can settle on no demarcation of color and moves over the surface with nothing to hold onto. Alien looking and anti-eyeball, sprayed gradients are the realm of the void--a non-space--and evocatively so. Artists like David Ostrowski, Adam Henry or Keltie Ferris use spray in a chunkier or more literal way to examine the properties possible in the hovering of color through atomization. Ferris creates depths and fogs in her paintings while Henry creates autonomous geometries hovering on a fresco-like white background. David Ostrowski’s painting is the most simple and rudimentary green spray sitting somehow both boldly and meekly on a big white expanse. Trudy Benson includes a painting that has both sprayed elements and painted elements in the shape of the Photoshop “spray tool” looking at what the semiotics of spray includes and how a computer suggests it. Austin Lee’s work remains almost entirely in the realm of the computer-generated image aesthetic--though all his paintings are handmade with airbrush--and the figures and settings are cartoonishly left-handed and humorously maladroit. Michael Dotson or Rosson Crow, Brian Belott or Wendy White use spray in works that are representational to selected and specific ends. Dotson uses spray in a digital way as a “gradient fill” where areas of the composition get a blast of color gradient to make a very screenic looking painting. Crow uses spray around her oil paintings of haunted-looking historical interiors to create a dreamlike atmosphere of hovering walls and furniture. Wendy White and Brian Belott here include sprayed and non-sprayed elements (a sweat sock, a photographic print, mirrored plexi) collaged together in hybrid compositions that perhaps ground the ethereality of spray in something tangible and recognizable. JIMJOE, KATSU and Jesse Edwards come out of public street spraying culture but make works that are not graffiti but tangentially relate: JIMJOE’s painting features the tail end and the barely beginning of two well-known graffiti writers’ "fill-ins", KATSU figured out how to program drones to carry spray cans and spray remotely: something very threatening to law enforcement but here in the realm of painting explores instead the technological mediation of painting. Edwards contributes an airbrushed ceramic television of semi-blurred-out Disney figures, emphasizing the rebirth of spray being tied crucially to our screenic culture. Jessica Ciocci’s multi-panel piece emphasizes the DIY and handmade aspect of spray through the repetitive stencil compositions, highlighting how a can of spray paint puts rapid color in the hands of everyone and is a powerful and democratic tool. Dennis Hoekstra exhibits a multi-panel painting where, using spray and other secret faux-finishing techniques, he can recreate the distressed and diverse surfaces of the streets on canvas. Added on May 27, 2014 by Evan Gruzis. Added on May 6, 2014 by Evan Gruzis. Added on May 4, 2014 by Evan Gruzis. Added on April 30, 2014 by Evan Gruzis. Added on April 22, 2014 by Evan Gruzis. Atavistic Zen at DUVE Berlin: April 26th - June 7th. Added on April 20, 2014 by Evan Gruzis. Added on April 10, 2014 by Evan Gruzis. Super Dakota is delighted to announce its next exhibition Silvier. The title Silvier comes from the James Joyce's poem "Schevingen, 1927". It's the idea of struggle and resolution being a constant part of the artistic process. Each piece is the result of finding a balance between positive and negative space, passivity and action. It is through the artists' guidance that each composition emerges with the imprint of these adaptations, each painting achieves its own individual equilibrium, which is discovered through its formation. Including works by Christian Vetter, Evan Gruzis and Manor Grunewald. I will have work at the Dallas Art Fair with The Green Gallery alongside Nicholas Frank, Michelle Grabner, Margaret Lee, Emily Sundblad & Spencer Sweeney: April 11 - April 13, 2014. Added on March 31, 2014 by Evan Gruzis. Added on February 2, 2014 by Evan Gruzis. 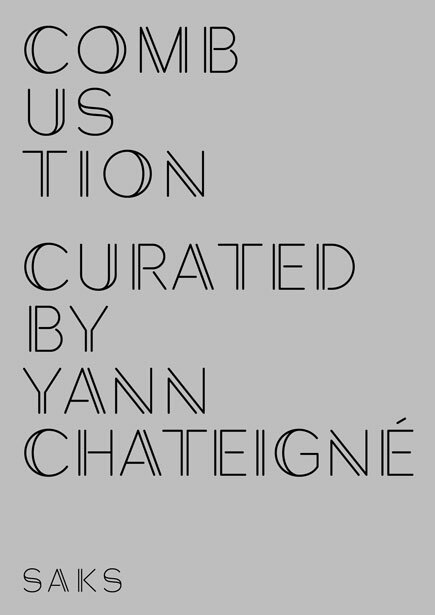 Une exposition de Yann Chateigné. Yann Chateigné est critique et curateur. Depuis 2009, il est responsable du Département Arts visuels de la Haute école d’art et de design de Genève. Parmi ses expositions récentes, on peut citer Seismology (Palais de Tokyo, Paris, 2012), Le rideau des rêves (IAC, Villeurbanne, 2011), Fun Palace (Centre Pompidou, Paris, 2010). Il a publié dans divers ouvrages collectifs et catalogues, ainsi que dans Artforum, Frieze, Kaleidoscope, Art in America, Artpress et Criticism. Il est diplômé de l'Ecole du Louvre à Paris. Inspirée d'un texte de W.G. Sebald, Combustion conclut une trilogie entamée avec Panegyric (Forde, Genève, 2012), d'après Guy Debord et La vie matérielle (Fondation Ricard, Paris, 2013), d'après Marguerite Duras.